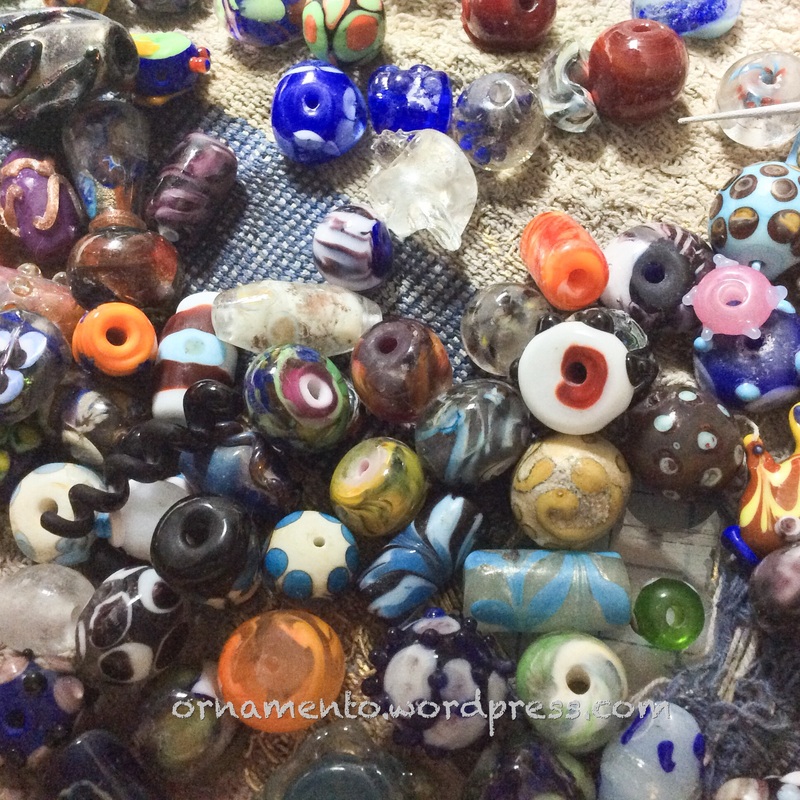 Yes, there is such a thing as an ugly bead. I should know because I have made so many of them. The ones you see below are glass rejects that I have accumulated over the years. They suffer from such defects as garish colors, drippy dots, pointy ends and general whopperjawdidity. I had a sack of ugly beads that I had saved over the years. At first I thought I would give them away. But why should I give away crappy beads? Then I thought I would toss them. “No,” I decided, I’ll put them in the recycling bin. “No, I’ll sprinkle them in flower beds in the neighborhood.” No, that didn’t feel right either. And then I decided to pull out the kiln and see if I could make them into something beautiful. And Viola! 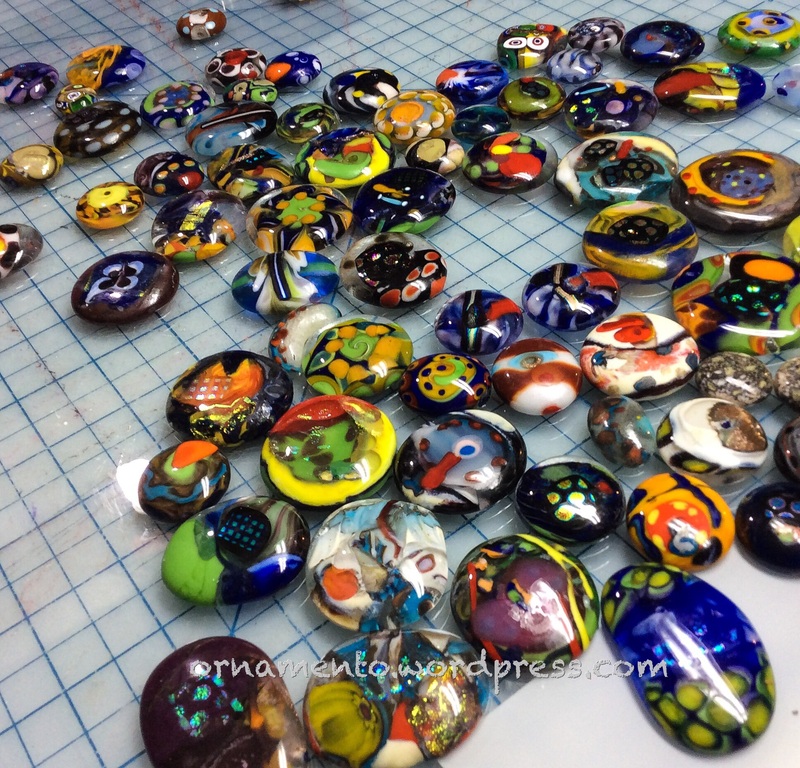 All the glass cabochons in the picture below are made from the ugly beads you see in the pictures above along with a little dichroic, Moretti rod chips, stringers and some flat clear Moretti. 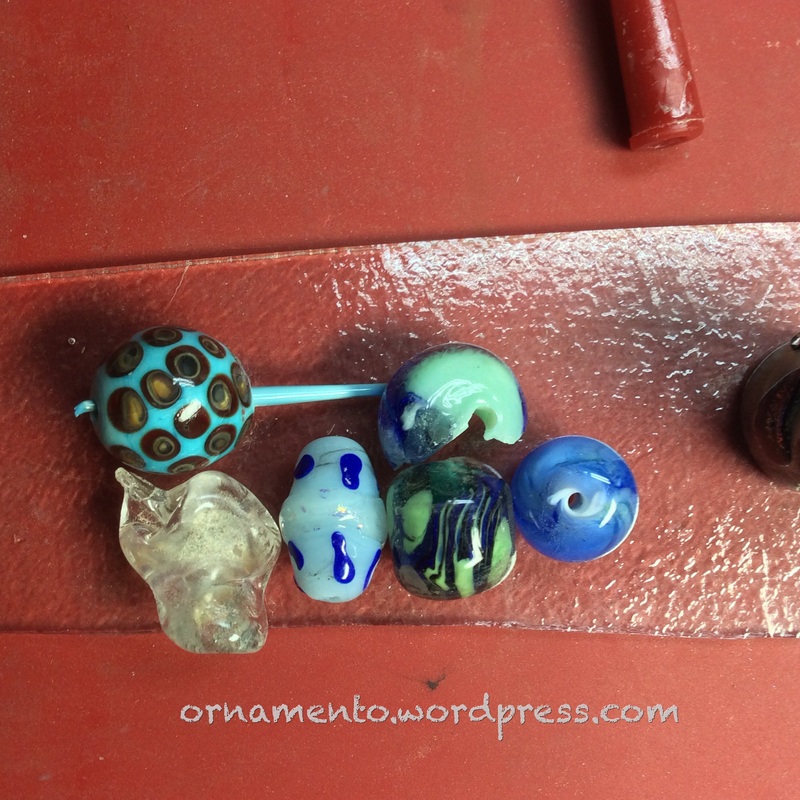 I put the beads in the kiln a few at a time and melted them (after cleaning out all the holes thoroughly) I broke up some beads and rearranged the pieces. Some beads I stacked on top of other beads and put a stringer of a contrasting color glass down the middle. Orange bead stacked on a blue bead with aqua stringer. Spacey! 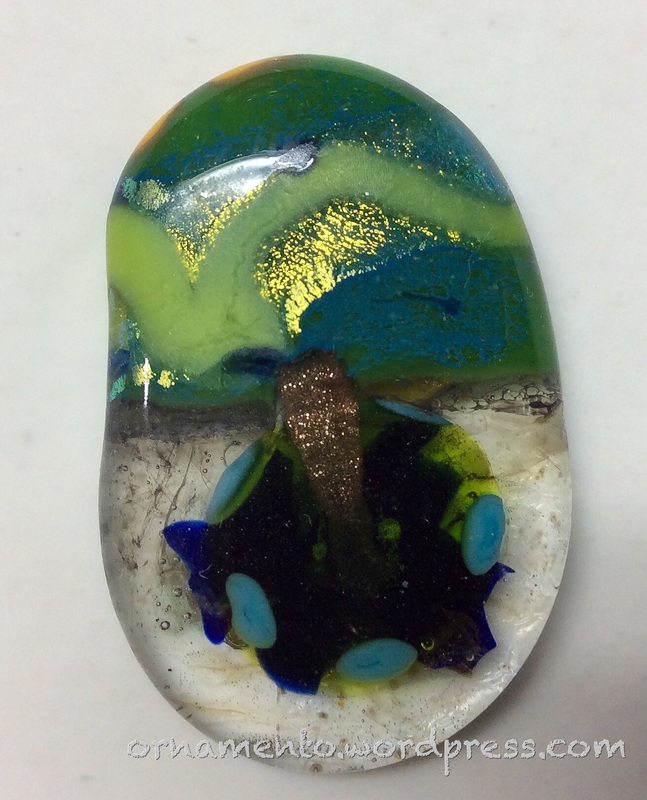 If I only liked part of the fused cabochon, I cut it off and combined it with something else I liked. 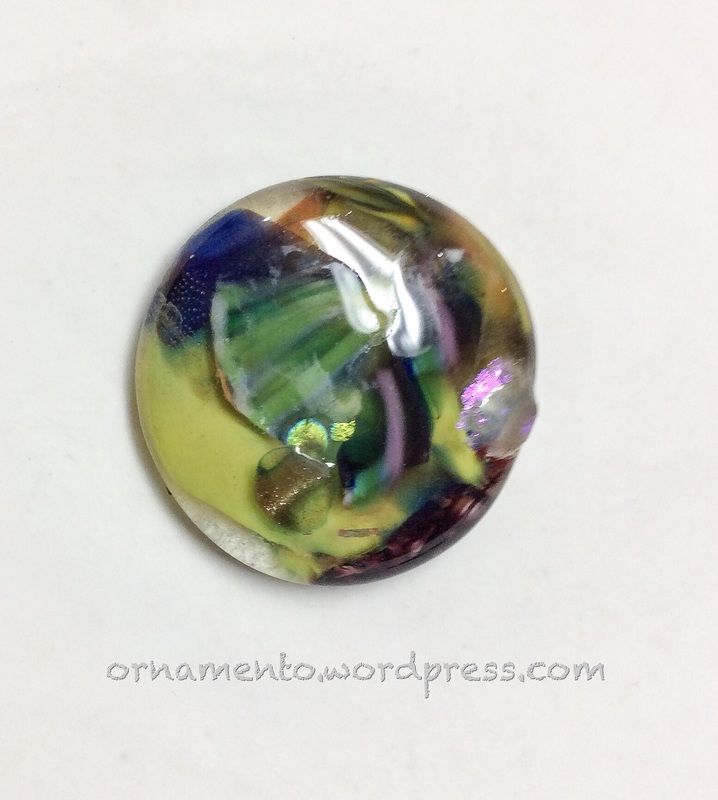 I added dichroic class for interest to some of the cabs. I didn’t want to use too much. 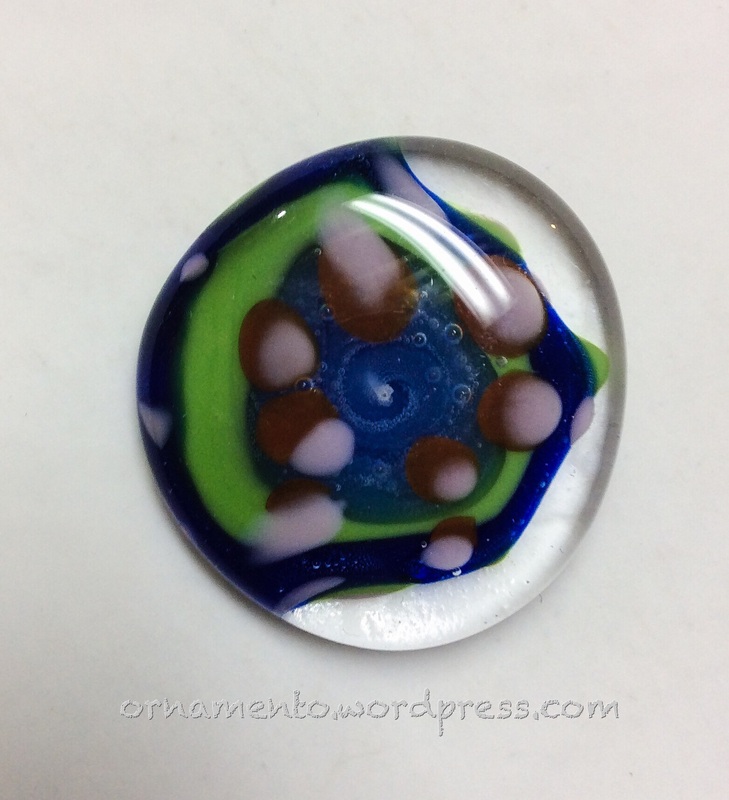 I think that fused glass cabs fill of dichroic glass are boring. The cab above is a disk bead with dots around it stuffed with goldstone stringer and topped with a layer of clear. Later I fused it to another partial cab that I liked. Sometimes I liked the bottom of the cab more than the top. So I just cleaned off all the shelf primer, turned it over and fused it again. 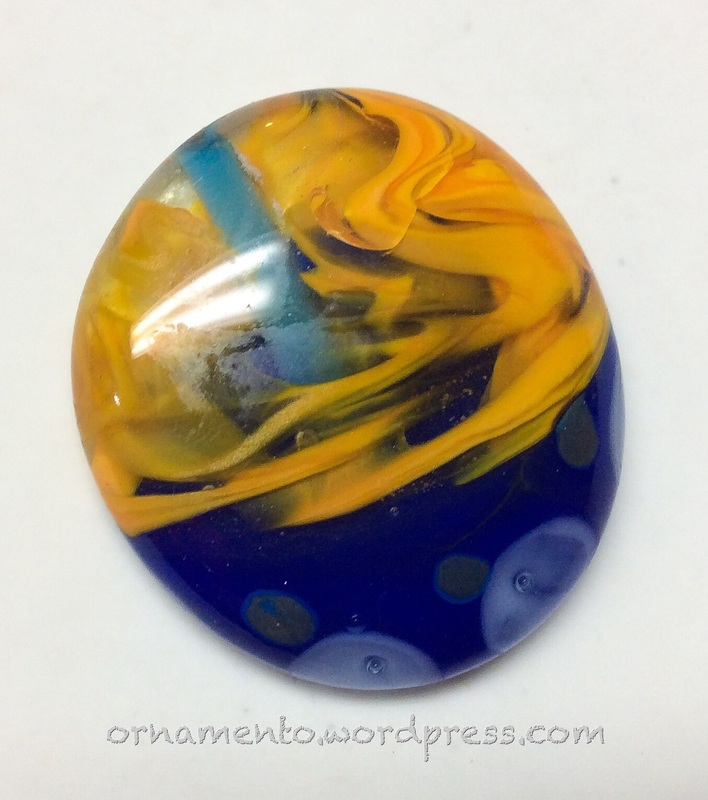 This one is a clunky star bead that I fired with a layer of clear over it. I considered trimming off the places where the color did not flow and firing it again, but I like the contrast between the clear and the color. I like the bubbles too. The white dot in the middle is where the hole in the bead was originally. I plan to post some more specific directions and before/after pictures. By the way, the glass is Moretti and the kiln is a Jen-Ken Bead Annealer hooked up to a Kiln Controller.